Talking of feeble. Over the course of two games against Saints this season, Manchester United have managed the sum total of just two shots on target. In 180 minutes of football, not counting any extra time. Granted those two shots turned into goals from van Persie, which earned ManU a thoroughly undeserved victory at St.Mary's. This time the Saints defence didn't give the much vaunted ManU forwards so much as a sniff of a chance. So much so, that by the end of the game van Gaal's only response was to put Fallaini on and pump long balls up to him. Not even the derided Moyes was that clueless. Saints really did a number on ManU, Saints defence did not make a mistake all game. Meanwhile, up at the front Chris Smalling seemed to be continually wanting to take Pellè's shirt off his back and yet it was a long, long while before the referee had a word with him. Sky seemed to delight in showing these assaults in slow motion. In one, Pellè's shirt was up around his armpits! I can remember a time when the defender was penalised for this sort of thing. Not these days it seems. At the start we saw that Dutch winger, Eljero Elia was handed his first start since joining Saints on loan from Bundesliga side, Werder Bremen. Tadić and Long looked like a potent striking force, but they would start the game on the bench. Saints started brightly, with Clyne narrowly shooting wide. It then settled into a stalemate, with the majority of the game being played in midfield, but when the influential Toby Alderweireld pulled up, with what looked like a really bad injury after about twenty minutes, things did not look too promising for Saints. Alderweireld knew straight away that it was bad and signalled the bench. While he was led off the pitch, there was some confusion, with the game restarting before the substitute, Florin Gardoş, was able to come on. Thankfully Gardoş then went on to have what was probably his best performance since joining Saints. If Alderweireld is out for several weeks, as seems likely, than Gardoş will need several more performances like that. Half time came, with nothing much further in the way of action to talk about. Saints defence had ManU under lock and key, with Forster not much more than an interested bystander. 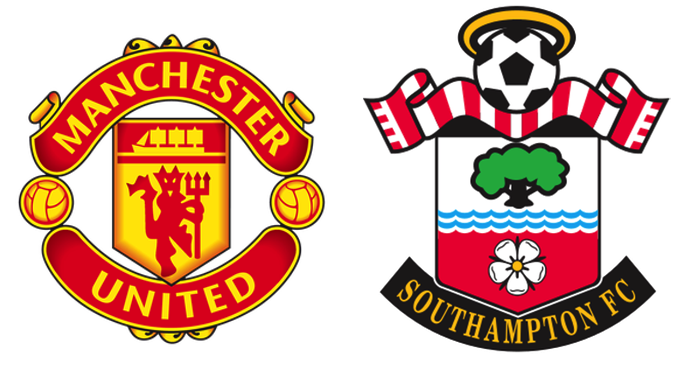 I did expect that ManU would try something different, but it was Saints that seemed to up their game instead. Not only were ManU's attacking ideas sadly lacking, but their defence seemed to be utterly clueless. Smalling seemed to regard the ball as some sort of explosive device and his only tactic was to continue to try and wrestle Pellè's shirt from his back. Jones didn't even seem to have that much of an idea. 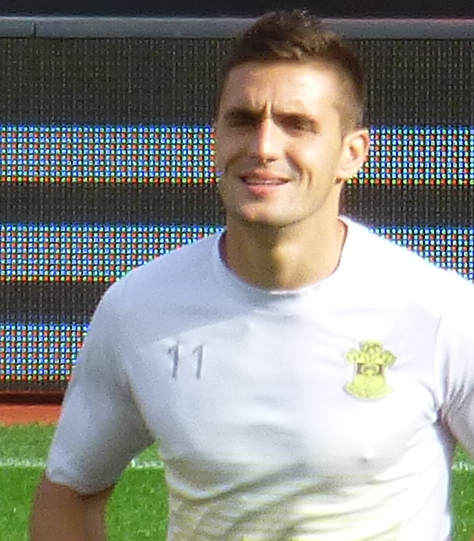 Eventually Elia, who had had an impressive debut for Saints, tired and was replaced in the 63rd minute by Dušan Tadić. The fresh pair of legs had an immediate impact and six minutes after Tadić came on, Saints were ahead. The build up around the penalty area involved Tadić, Ward-Prowse and Pellè, with the big Italian hitting the base of the goalpost and the ricochet came out to Tadić, who calmly side footed the ball home from about twelve yards out. This seemed to at last provoke a response from van Gaal, who took off Di Maria, replacing him with Fellaini. ManU then proceeded to pump long balls up to the Belgian, which didn't achieve very much. In the last few minutes Mata managed to miss three good chances, thereby illustrating why he is still over-rated. The delirious Saints fans at the game started ironic chants of 'We are staying up, we are staying up' and at the final whistle the players could reflect on a job well done. One of my favourite moments after the game, was an interview with Wayne Rooney who looked as if he were going to burst a blood vessel, as all the interviewer wanted to talk about was Saints performance. Wonderful. Apparently Saints were lucky and Manchester United were the better team. Deluded. My Man of the Match by a hairs width was José Fonte, who was superb at the heart of the defence, but there were great performances right across the park. Saints are now back up to third in the table and with a realistic chance of finishing in the top four. On this performance ManU will be lucky to finish in the top six.